Christmass Bliss can put some of the magic back into your festive season. 05 December, 2018 – If the run-up to Christmas leaves you feeling more fretful than festive, then help is at hand with the launch of Christmass Bliss, a new planning tool that will take all the worry away from planning the big day. “It’s the most wonderful time of the year” goes the song, but for those in charge of making Christmas happen, it’s a month (or more) involving lots of planning, a huge ‘to do’ list and the responsibility to make sure everything goes to plan. Whether it’s coming up with locations for elf on the shelf, organising the office Secret Santa, cooking Christmas lunch or just general organisation, the run up to Christmas can feel like a never-ending series of chores. Christmass Bliss has been designed for frazzled festive planners who feel in need of their own elf helper. 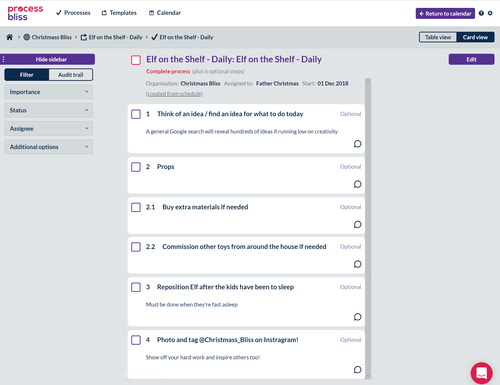 The tool has tips on how to approach a variety of Christmas processes, and will be adding a new one every day during December. 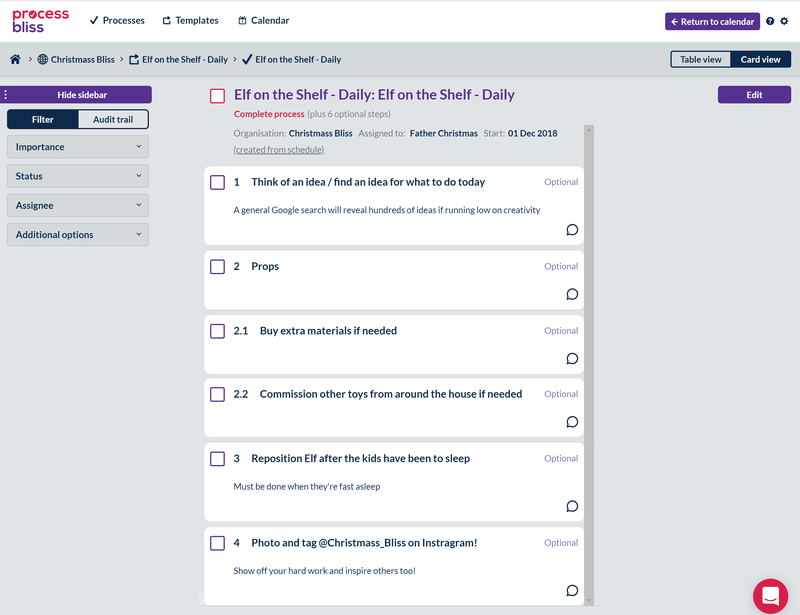 Users can then create their own tailored interactive checklists / planners for each Christmas process, and with all the right processes listed in the right order can enjoy the satisfaction of ticking off tasks as they go along. 2017 research by the Royal Society for Public Health revealed that 76% of people believe family arguments are the most stressful part of Christmas. But using Christmass Bliss during the run-up to Christmas (including Christmas Day itself) you will know who is supposed to be doing what and when they are supposed to do it by, giving all concerned a blissful and stress-free Christmas. Christmass Bliss is a free tool by Process Bliss, the easy to use process management tool that helps small businesses stay on top of their everyday processes and tasks. This press release was distributed by ResponseSource Press Release Wire on behalf of Rise PR in the following categories: Men's Interest, Leisure & Hobbies, Women's Interest & Beauty, Consumer Technology, Food & Drink, for more information visit https://pressreleasewire.responsesource.com/about.